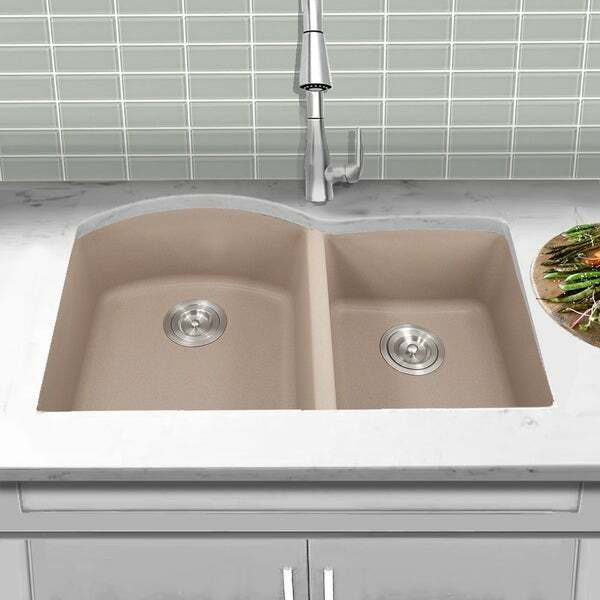 Highpoint Collection is proud to offer this 60/4/ double bowl undermount granite composite sink. High quality stone is quarried in Italy. Delightful speckles dance like grains of sand in this composite of stone and acrylic resin. Resists scratches, chips, and discoloration. The color is present throughout the sink, so is will fade with time. No need for rubber padding as the stone content makes for a naturally quiet sink. Able to handle thermal shocks and heat up to 560 degrees, this sink is extremely durable. The contemporary lines and rounded corners are easy on the eye and make for easy clean up. The double bowls let you double-task! Comes with 2 brushed stainless colander drains. Template is included for countertop cut outs. Beautiful neutral color will compliment many colors schemes. A note on color: Our digital images are of the actual product, however due to different computer monitor settings, we cannot assure an accurate interpretation for variations between the actual product and the color seen on your screen. Dimensions 20.5 In. X 31.5 In. X 9.63 In.